Top Ramen mixed with instant mashed potatoes for dinner, Lay’s potato chips for breakfast, enough miles to make stuff hurt and searching for a stealth camp for the first time since the PCT? I love, love, love this! I had one night to pick something to do with on our time at home. 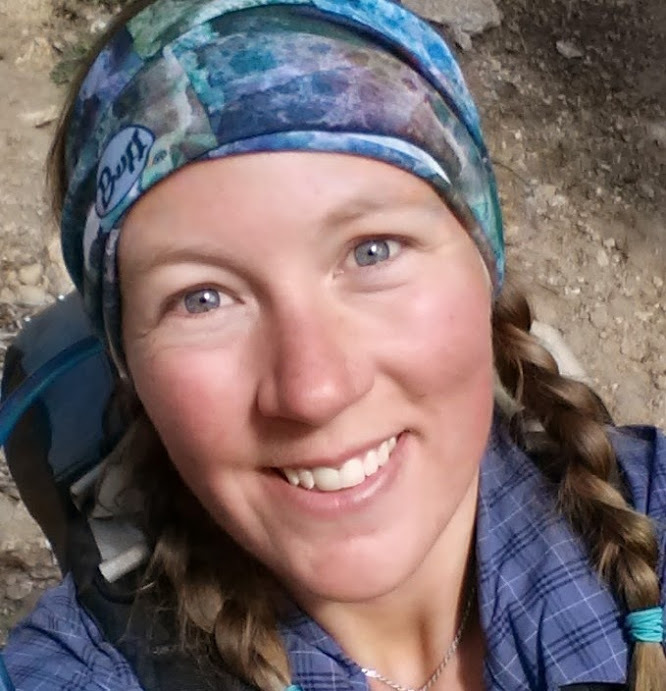 I went through a short stretch of feeling sorry for myself this past month – I missed the PCT and desperately wished I could find some magical way I could jump in with some friends that were finishing up the last 60 miles we all missed last year due to snow and the government shutdown. I wanted to be in the woods. The mountains. The desert. I stopped really caring where. I just wanted my backpack on as I pushed some miles under my feet. I nearly cried a couple of times as I drove our truck past giant mountains and gorgeous new country (for me) in Arizona. So when I got one night to do anything with… out came the backpack. On Friday I wasn’t very excited. At all. It was raining and it was freakin’ cold! But on Saturday morning, the sun came out and it turned out to be the PERFECT day for hiking. Perfect. It’s officially pre-fall. The air was cool. Just cool. 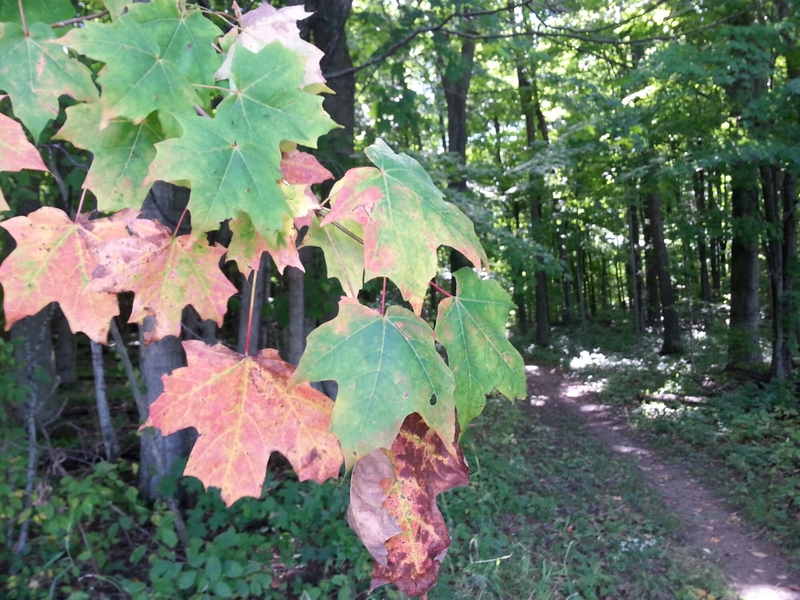 It didn’t have that “bite” that signifies late fall and that winter is on its way. Yet. 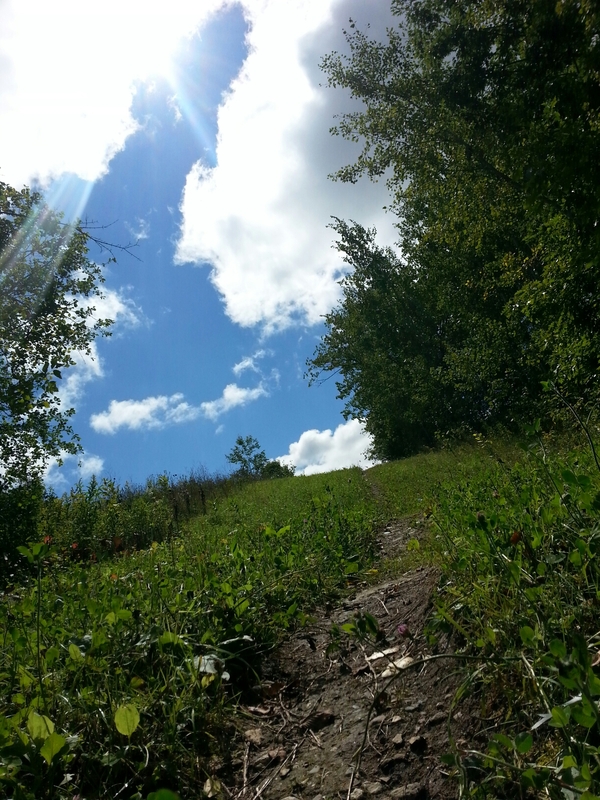 And when I hiked into patches of sunshine glaring down between clumps of forest, it was downright hot. Except for that perfect cool breeze. I head out to hike as far as my legs could carry me. I have to say I feel satisfied! I hiked between 17 and 18 miles on Saturday (in 7 hours) and 5 or 6 on Sunday. Full pack, too! I can still do it! I could’ve pushed a 20 if I had to. But I’m glad I was able to stop when I did. I was TIRED! It was good. 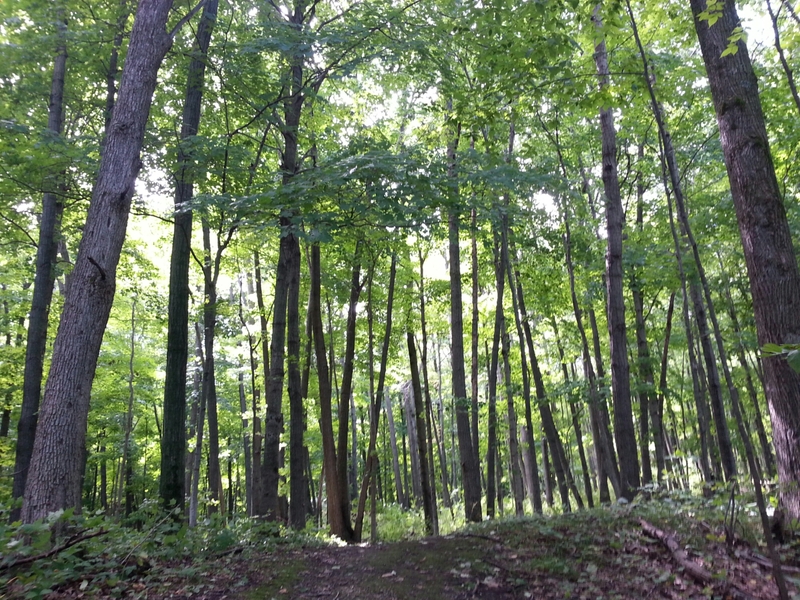 At about 6:30pm I came to an open patch of tall maples and oaks. 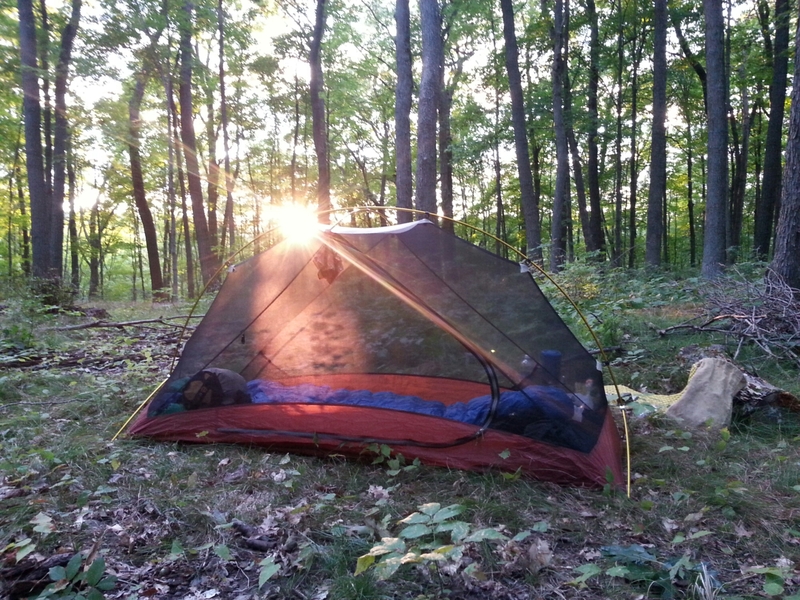 I hiked in until I was out of view from the trail, found a flat spot and set up camp. After my Ramen/mashed tater dinner and some hot cocoa, I hung my food and prepared myself for bed. I was pretty sore as I hiked the last miles back to the car. I took it easy and enjoyed the green leaves, breeze and sunshine. Another great day. It made me kind of wish I had a few more. 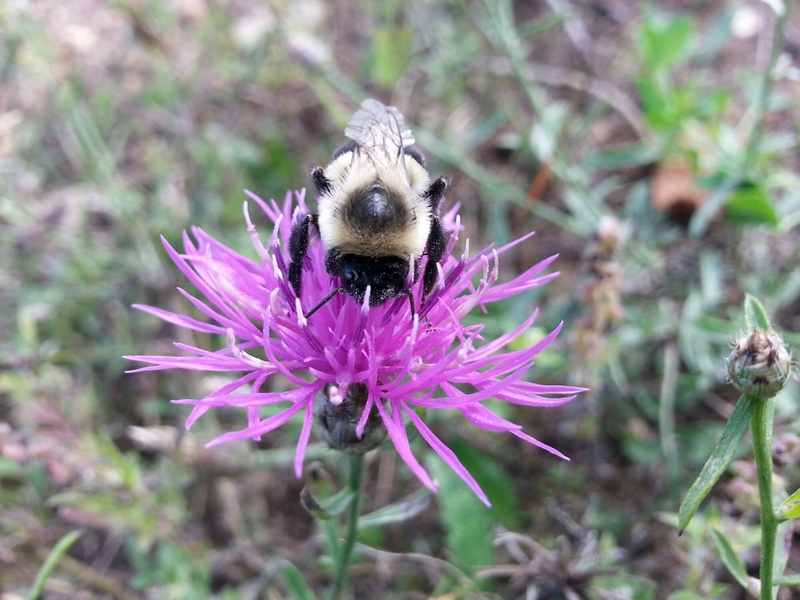 The bumbles are getting a wee bit lethargic in the cooler weather. I caught this guy mid-nap. On the way out I grabbed a burger at a small summer burger hut, then stopped at an ice cream shop for a cone. A great end to a great hike. Or wait… it’s not over yet! 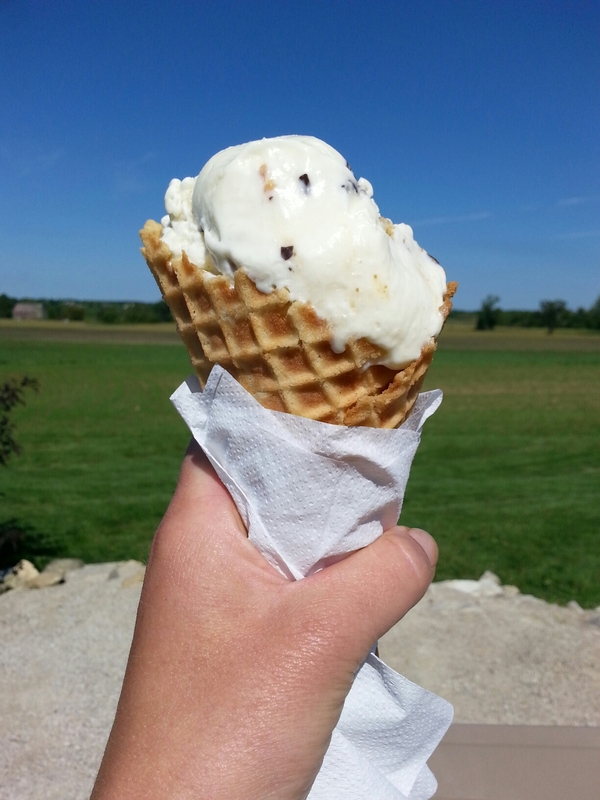 I had a great view of countryside and cows as I enjoyed my ice cream. I met Adam at a hotel, took a hot bath with a cold beer in hand, watched the Packers win, and now I’m going to sleep in a giant bed with fluffy pillows. Feels like a nearo. It could have been a PCT trip, who’d have known! Satisfaction. The only bummer was that my bathwater didn’t turn grey. I wasn’t out long enough, I guess! Maybe next time! Tonight I love foot massages. Because I’m totally going to sweet-talk Adam into giving me one! Socks! 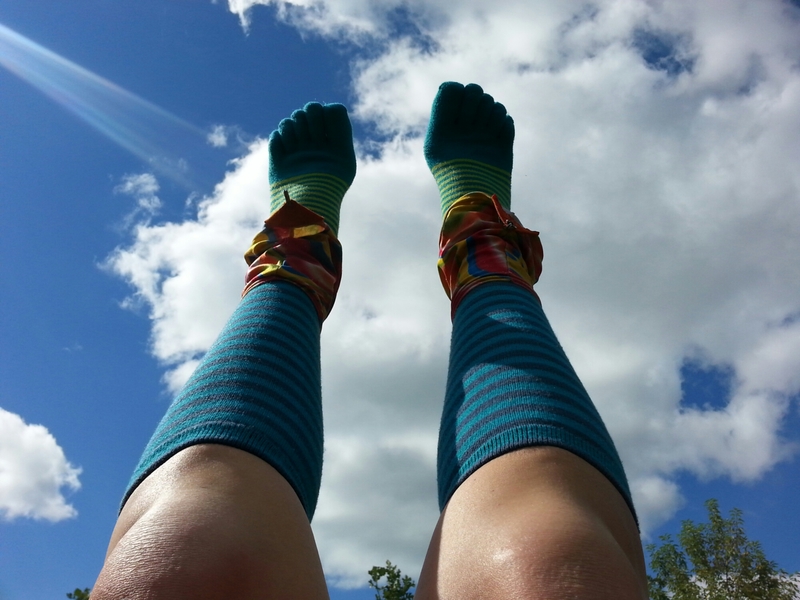 Perfect weather for my knee-high stripey Injinjis. Break time! 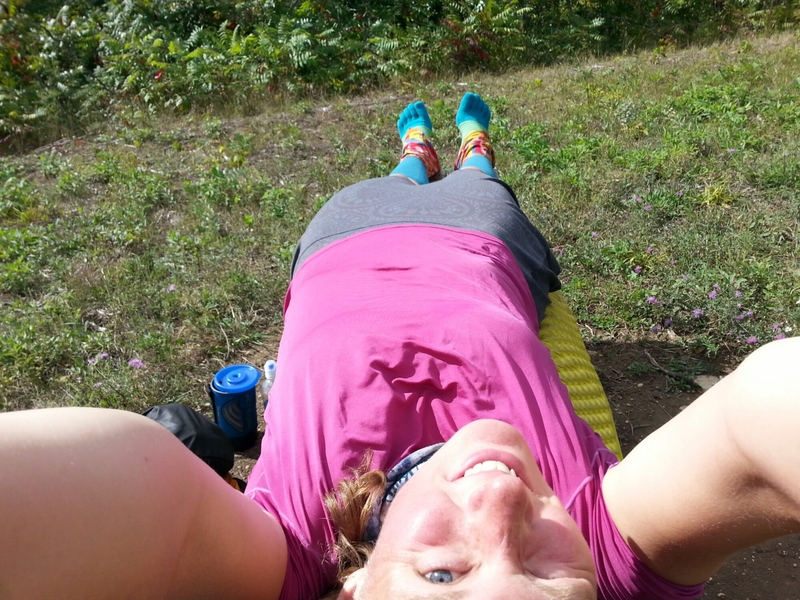 Chillin' in the sunshine, stretched out on a bench. We were on our route. Adam was driving and I was sleeping. We were headed to a delivery in N. Las Vegas on I-15 S. Adam came to a sign that said the road was closed due to flooding. A total road washout. On the interstate! Closed. Check out the quick little map below – there’s not too many roads that go into Vegas nesides I-15, especially when you’re in a big rig. Not many roads going into Vegas from the north! He was able to pull off at a truck stop and take a few minutes to assess the situation – which is that we couldn’t get to our drop from the north – but we could from the south. But that detour would be insanely long. So Adam hashed a plan and ran it by our night dispatch (it was in the middle of the night when this went down). Our second delivery was is Kingsman, Arizona. The Vegas drop only had three skids, so he thought maybe we could go to Arizona first, have them take the three skids off of the trailer to get at theirs, then put the three Vegas skids back on. 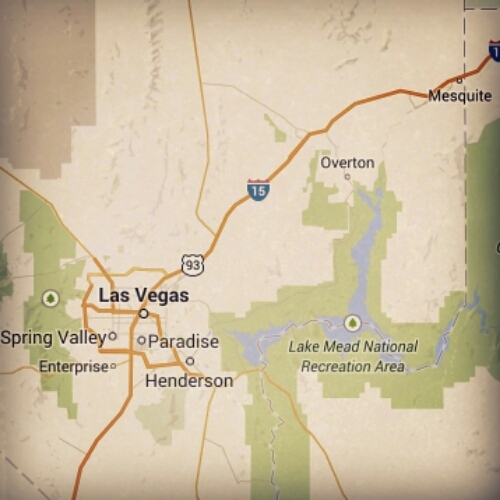 Then we could head north and enter N. Las Vegas from the south. The detour was still quite a ways out of route, but it beat sitting for who knows how long to get to Vegas via I-15 – it would literally be days. That’s not gonna’ work! Dispatch was on board, so on we went. I woke up around 1am and peeked out the windshield at a drizzly, pitch-black, two-lane highway. Adam explained the whole situation to me. We were driving through the Grand Staircase Escalante National Park on US-89. I know, not a bad detour, right!? Unfortunately all I could make out of what I knew was incredible scenery was the black, looming shadows of giant rock formations set against the dark, cloudy, but full-moonlit sky. I just sat and watched it all fly by… in the dark. We made a driver switch just a little ways before the Utah/Arizona border. I stepped out into the warm drizzle to do my pre-trip inspection of the truck and immediately smiled. 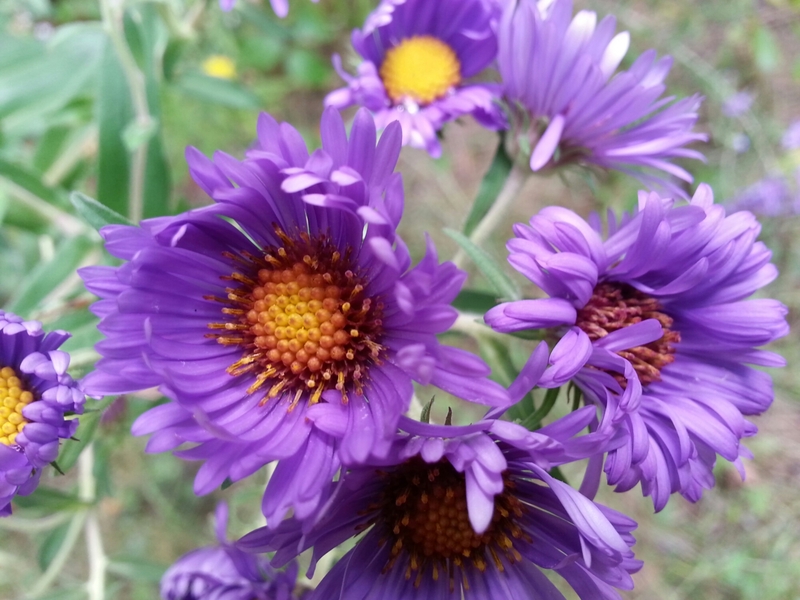 The best smell ever – sage bush mixed with the sweet scent of juniper. It’s a desert-y smell that takes me back to the freedom of past hikes – particularly a Utah section on the American Discovery Trail. I love that smell. I took in as much as I could. 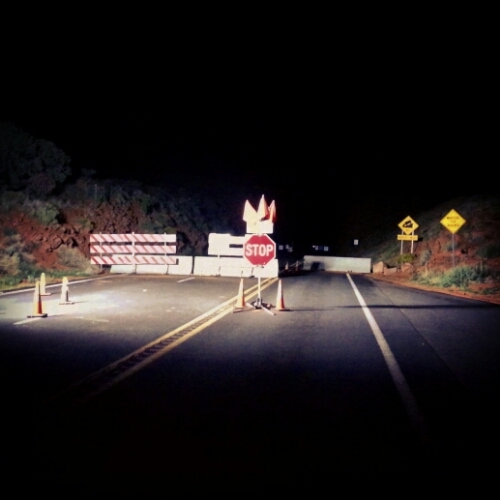 Then we hit our next road block – in a very literal sense! Our detour - barricaded and very-much closed. We drove through construction and across a one-lane dam with flag men working at 4am. A mile or so later I saw a sign that read, “road closed 18 miles ahead – local thru traffic only.” Um… what? It’s just a two-lane highway with no marked truck routes nearby, according to our atlas. Neither of us saw any detour signs so we drove on hoping there would be something further ahead. There wasn’t. The road was really closed, too. I’m talking cement barricades, cones, ropes, and beyond that, a chain-link fence. Adam looked it up online – a landslide. We. Are. Screwed. Adam found a road on Google maps called “89T,” but it wasn’t on our truck maps and we had no idea if we were allowed on it. I called the Arizona Highway Patrol, and after being transferred about four times, I was finally given restrictions for this 89T road. 63′ x 10′ – 125 tons. Hey, that’ll work! We turned around (thankfully there was a pull-off at the road closure that gave us enough room to do so). We drove all the way back to the one-lane dam and turned just before it to get to 89T. An hour later I was finally back on our first alternate route. The rest of the drive went okay. We got to our Arizona delivery eight hours later than when we wanted to reach our first delivery, but after a phone call with our [super-awesome] driver manager, it was all sorted out. The last two drops will happen Wed. morning, and our two pick up appointments were moved back. Whew. What a fiasco! I don’t even know how many extra miles we drove! The fun part of this whole thing was once the sun started to come up, I could admire the local terrain. This was my first time in Arizona. I have yet to find a state that I don’t love something about so much that I ache to come back. It was rainy on and off, but the clouds floated so low it almost seemed like I could reach outside my window and touch them. The sun would poke through every now and again laying a really cool glow on everything. It was a pretty drive. It turns out that with our detour and route back to N. Las Vegas, we drove through the Staircase Escalante National Monument area, Glen Canyon, the Lake Mead Recreation area, we basically circled all the way around the Grand Canyon, and passed right by the Hoover Dam on US-93! What cool country! Now. Tomorrow? It’s going to go smoothly, nothing weird will break on the truck, and mother nature will be sweet to us. I just know it! Tonight I love brown signs. They equal fun. 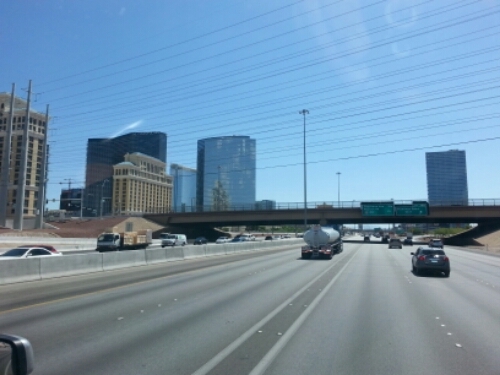 Driving past the Vegas strip. We did eventually make it! 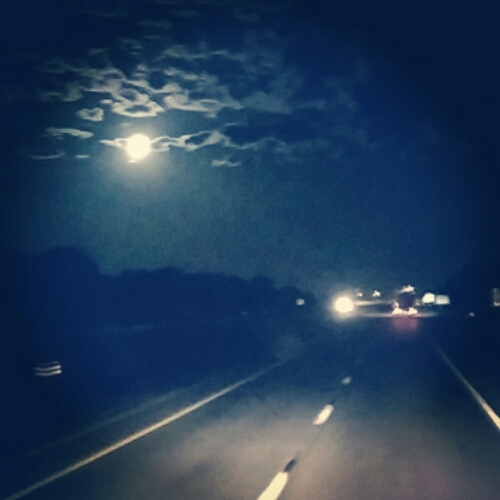 A full-moon lit night of driving. This is not my photo - I found it online. 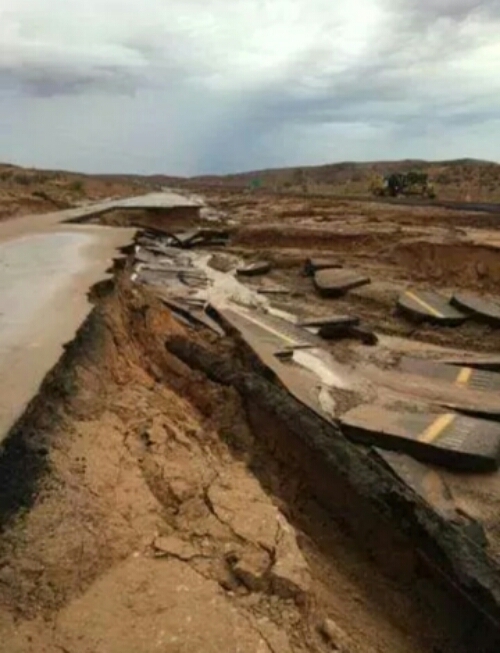 This is I-15 where the flood waters washed it out. What a mess! I got to see four new states and we drove through the Bronx in New York City. It’s been an exciting week! First we drove from Wisconsin to Virginia. Then back to Wisconsin. Then towards the Pacific Ocean and California. Then we rolled back to Wisconsin, dropped our loaded trailer of smoked provolone cheese, picked up a trailer full of coiled metal and head towards the Atlantic and Massachusetts. This is where I entered into four states I haven’t been to before! New York, Connecticut, Rhode Island and Massachusetts. 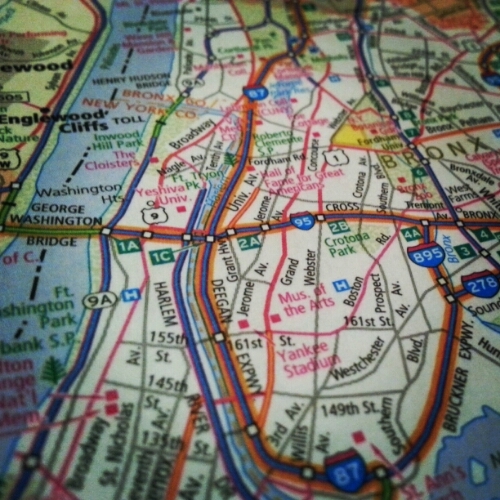 To get to our delivery location, we passed through New York City. It was Labor Day so we strategized our route. Usually we plan around workday rush hours. But this was a holiday – will the traffic be better or worse? We called upon our trainer (who we both trained with when we started with Midwest Carriers) for advice. He impressively remembers everywhere he’s been, can give detailed directions on a whim and always seems to give great advice. He thought both the I-287 bypass around New York City and I-95 directly through it would both be jammed up, if they were, because everyone would be heading home after the holiday weekend. He said it probably didn’t matter either way but suggested I-287, which skirts around the north side of the city, going over the Hudson River at the Tappan Zee bridge. Easy-peasy. Then we approached our turn-off to the bypass. It was dark and late evening – close to 10 pm. Neither of us had ever been in NYC and we had plenty of time to get to our destination. Adam was driving, and he brought it up – “Whaddya’ think about going through the city?” It was a quick decision as our turn approached. Eh, what the heck. Why not!? We passed by our turn, heading for the city. 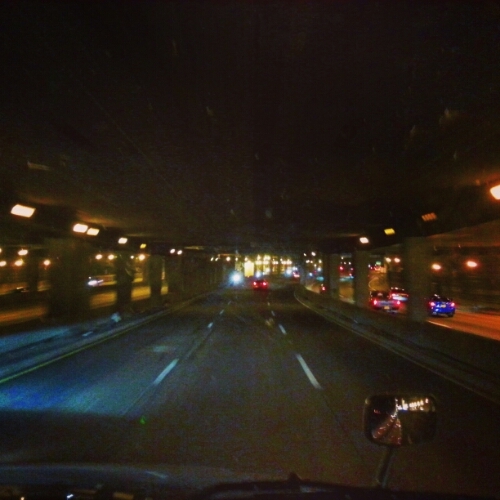 I-95 was our route - across the bridge into the Bronx. I pulled out the atlas to check truck routes – you know, just in case there’s something weird. I didn’t expect to see any road restrictions. But there were. 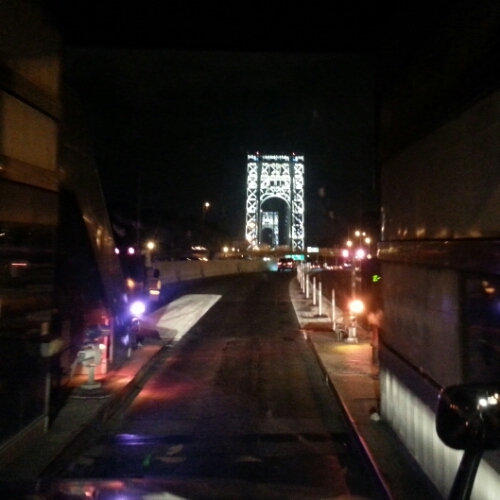 I-95 between the George Washington bridge, through the Bronx, to I-87 listed low clearance bridges. I’m talking 12′ 6″! We are 13′ 6″ – that’s a whole foot too low! I gave our trainer a call. I guess these bridges are measured from the curb to the lowest part of the bridge or something goofy and they’re higher than listed. He assured us we’d be okay. 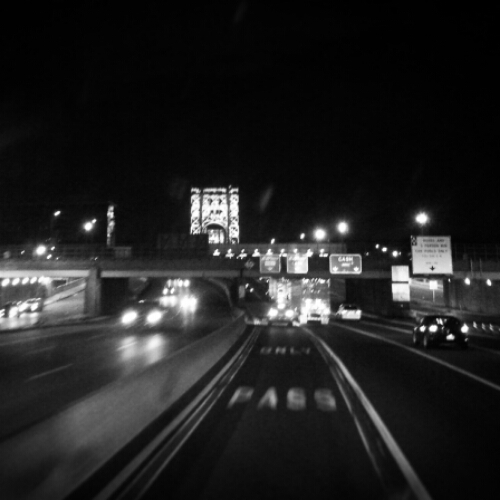 Out of Jersey, up the hill, through the tollway, and onto the upper deck of the ginormous, beautifully lit-up George Washington bridge over the Hudson. Skyscrapers and large buildings that I wish I could identify sparkled in the distance in every direction. Cars zoomed past in streaks of red taillight. It was exciting! It was beautiful. George Washington bridge up ahead through the tollway. Then over the bridge, into the Bronx. We approached our first 12′ 6″ clearance. I wished so hard that there was another big rig in front of us so I could see that he passed through safely first, but no such luck. In we went, my face plastered up against the windshield, looking upward, cringing. Zooom… nothing. Whew! It was close, too! Pretty freaky! We had several of these, but safely squeezed through each time. What a cool experience! Oh, and we totally lucked out with traffic. No backups and we rolled on through pretty smoothly. Adam drove like a rock star. Because rock stars apparently drive pretty awesome. Then I went to bed, slept hard, woke up and delivered, picked up a couple of loads in CT, and now we’re headed back to Wisconsin just to head out again. We are enjoying the continuous runs. We just keep on a’rollin’. Now we just need to find a spot to get in a load of laundry. Ahhh, the truckin’ life. I love this. Tonight I love sweet peppers. I’m hungry.